Everybody loves a parade: Floats, waving flags, marching bands, all followed by a crew of rowdy punks mocking everything decent and respectable, including the town itself. 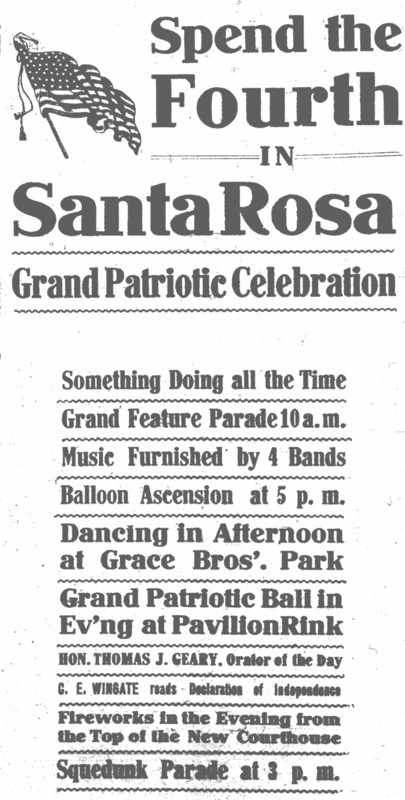 It was the Fourth of July in Santa Rosa, 1908, and it was the last ballyhoo of the Squeedunks. Back then, Fourth of July celebrations were a day-long affair that brought out the entire town. "Young America, ably assisted in many instances by old America, too, from dawn until midnight kept the firecracker on the bang. The rip-rap, rocket, red devil, squib, and other varieties kept up a merry roar and sputter," wrote the Press Democrat, and rather poetically, at that. After the morning parade, most people drifted to the park at the end of McDonald Ave. (The former "City Gardens" was really more of a beer garden, owned by the Grace Brothers brewery; it is now the Creekside Park apartment complex at 1130 4th Street.) 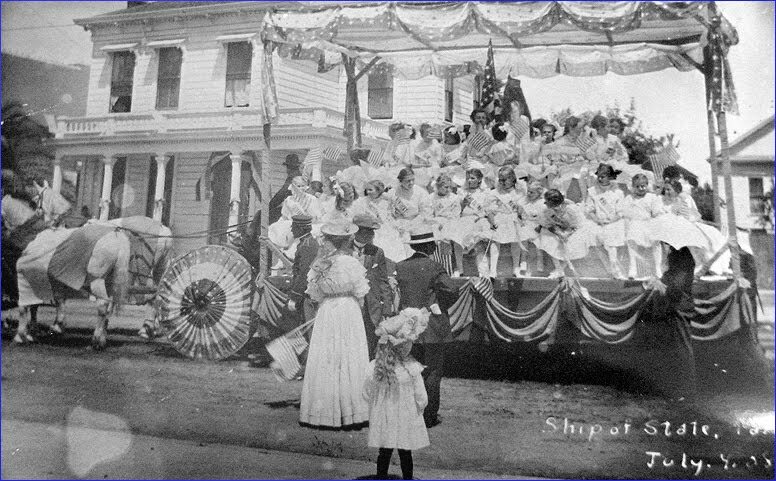 Here bands played patriotic tunes, kids recited "literary exercises," and the public heard a tub-thumping patriotic oration about battleships along with a dramatic reading of the Declaration of Independence. The emcee for the entire program was our own James Wyatt Oates. At the end, everyone joined in singing "America" and scooted back downtown, where the real fun was about to begin. An outsider might have believed he had stumbled upon a parade of lunatics. Led by a man riding a cow, a procession of wagons carried displays that seemed to compete for being the most bizarre. A portrayal of a vacant lot surrounded by a worn fence; a scrap pile; a bush sprouting eggs and umbrellas; a horse watering trough fitted with a crane that picked up rocking horses and lifted them up for a "drink." Less funny today are the swipes made about women. The "Latest Improvement of the Woman's Improvement Club" float made fun of the suffrage movement by portraying a woman enjoying a bicycle ride while men toiled at housework. Another float presented their elected queen and maids of honor, all men in dresses - a holdover from the 1900 parade, when women seeking to join the Squeedunks were rebuffed and an all-drag royal court was flaunted instead. Boys will be boys pigs. When the county's honored "First Citizen," General Mariano Vallejo, ended his long oration (in Spanish, with a translator) and the formal portion of the celebration drew to a close, a band of masked men in outrageous costumes seized the podium and began a mock-heroic "Oh Ration," an extemporaneous and outrageous send-up of the venerable Vallejo's speech. "One hundred years ago today, the booming of the patriotic cannon awaked from their heroic slumbers a band of ancient Squeeduncques..."
The Squeedunks again demonstrated this take-no-prisoners attitude when they went ahead with their July 4th parade in 1881, although Santa Rosa had called off regular festivities out of respect for President Garfield, who had been shot a couple of days earlier. Even their name made a anti-authoritarian statement. At least as far back as 1858, "Squeedunk" was a derogatory term for a place where backwards country folk lived. (There is a Squedunk Road in a remote section of upstate New York). Calling themselves "Squeedunks" might be something like today's college students living in modular housing creating "The Trailer Park Trash Association". We'll define ourselves, thank you very much. Not to say that the 1908 Squeedunks didn't embrace the buffoonery of it all. The Press Democrat had stories in nearly every issue during the weeks leading up to the parade, documenting the latest silliness by "The Ancient and Disreputable Order of Squeedunks," and matters became very silly very fast. At their first meeting at "Temple Bacon" (Bacon's Garage on Main street), committees were formed to organize volunteered horses, wagons, and automobiles; the next week, the groups were merged into the "Committee on Freaks and Skates." It was first announced that the best float would be awarded a "handsome loving cup, of artistic design" but that was changed to a "loving bucket... more approaching this taste and capacity of competitors." (In truth, they gave themselves silver cups, crystal goblets, and other awards that couldn't have been cheap). Sexist they were, but the 1908 Squeedunks were surprisingly progressive about race for that time. A participant and an early front runner in the queen contest was Quong Sing, a Chinese merchant. Apparently seriously concerned that he might win and not be able to sell fireworks and American flags on the holiday, he had to be talked into staying in the contest (as usual, the PD reported him speaking in pidgin dialect to make it "funny"). Quong raised $15.50 for the parade from his community, which was duly recorded as a donation from "the Chinese Squeedunk Tong Cantonese No. 1." The boys also raised a fuss over the suggestion that the queen wear a "directoire" or a "peek-a-boo waist" (the former was a tight-fitting floor-length gown; at the time, a "peek-a-boo" was apparently any blouse with open lace or a sheer material covering the arms, cleavage, or shoulders). These styles were "not becoming for fleshy people," protested one Squeedunk, and "John Walker says he has worn clothes pretty near all his life and he is not going to leave them off now." It was agreed that the royal court could wear "chest protectors" beneath their garments. All in all, it was a great success, the event ending as District Attorney Clarence Lea read the "Declaration of Indifference," and another member read the "Squeedunk's Poem." Their satirical paper, "The Truthful Lyre," sold like hotcakes. Once the prizes were awarded, it was announced, they would be exhibited in the display window of a downtown store. "Due announcement will be made of the time of the display so that there will be no danger of overcrowding in front of the store." Obl. 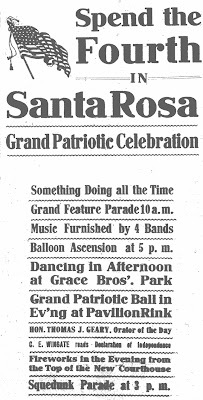 Believe-it-or-not epilogue: As bizarre as it was, the wacky parade by men wearing grotesque masks was not the most remarkable thing that happened in Santa Rosa on July 4, 1908. As evening approached, there was a hot air balloon ascension and parachute jump by "Captain Hamilton, the noted aeronaut." Hamilton jumped from the balloon, and fell directly upon the skylight at Moke's funeral home on Third street, raining broken glass into the chapel and frightening Mr. and Mrs. Moke, who were apparently entertaining at the time. "I'm not a dead one just yet," Hamilton quipped. Long time readers might recall that back in 1905, "Professor" Hamilton was in town for a show where his wife was the jumper, and earlier that year, he had been touring with a parachuting monkey named "Jocko." You could not make this stuff up, honestly. This evening at the rooms of the Chamber of Commerce there will be a meeting of the Squeedunks to arrange for the parade on the Fourth of July. All members of the old organization who provided the fun in the parades in the days gone by and all new enthusiasts are asked to be on hand this evening. Eight o'clock is the hour of the meeting. Charles H. Holmes, who years ago was orator at the last Squeedunk parade of consequence given here, on the memorable occasion when Virgil Moore edited "The Truth Lyre" as a special Fourth of July number, announced yesterday afternoon that the voting for "queen" of the Squeedunks will commence today. Holmes is a "cracker jack" when it comes to being a funmaker on Squeedunk Day and he will take an active part in this year's celebration. There will be a meeting of the Squeedunks tonight at Bacon's garage. "The Ancient and Disreputable Order of Squeedunks" held a largely attended meeting Thursday night at the "Temple Bacon" on Main Street to arrange for the part the Squeedunks will take in the great celebration here on Fourth of July. There was a large gathering of the old Squeedunk clan as well as a number of novitiates and it is safe to predict that there will be all kinds of merriment when the Squeedunk parade makes its escape on the afternoon of the Fourth. "It was a great meeting tonight," said the Arch Squeedunk, at its conclusion when discussing what has been accomplished. "We branded about 150 victims." "The Grand Chief Grafter and the Keeper of the Records and Bale Rope were among those present. The Gold Dust Twins' sat in meeting by request. There'll be lots doing on the Fourth and don't you forget it." ...Charles H. Holmes the noted Squeedunk speaker, will be the orator of this occasion. "The Declaration of Indifference" will also be specially prepared as well as the "Squeedunk's Poem." It was announced last night that the candidates for the Squeedunk queen are Jack Smith, Frank Dowd, Doc Miller, Doc Somerfield, Joe Ridgway, Aubrey Barham and Quong Sing. It was reported that Quong Sing, if elected, would resign in favor of Doc Cozad, but upon being interviewed he denied the rumor. He claimed this report was started by Sam Gilliam to injure his chances, and if elected he will serve to the best ability. The committee says it is only interested in seeing the handsomest and best citizen elected. The queen will have the right to appoint his own the maids of honor. Jack Smith, 80; Dr. Bogle, 40; Dr. Sumerfield, 45; Dr. Cozad, 42; Aubrey Barham, 64; "Uncle Bill" Smith, 3; Frank Dowd, 60; Dr. Miller, 128; Quong Sing, 120. Election fraud is already being charged. Dr. Summerfield claims that Aubrey Barham wants to be elected so that he can appoint his friends as maids of honor, and thus dispense political patronage. Aubrey refuses to withdraw claims, and says that he has positive information that Summerfield has hired 14 new stablemen to pack the vote. The committee promises both to enforce the purity of election law. The Ancient and Disreputable Order of Squeedunks held a regular meeting last night at the "Temple Bacon." There was a large and enthusiastic attendance. Many new features were listed. Jim Johnston, "the big red one," will send a float from Forestville. In the queen contest a dark horse appeared with 160 votes at first jump. The vote stands: ... Quong Sing was told while in Bower & Mercer's the Drs. Miller and Summerfield would beat him unless he voted for himself. So he voted five votes and paid his 25 cents, treated the boys and went away. In a little while he returned, and seeing that he looked worried, he was asked with ailed him. He replied: "I don't think I can be queen. You see, I sellem fire clackers, I sellem flag. Be queen no see me nobody buy." It was explained to him how disappointed every one would be, and that he would "spoil the Fourth" and that it would be "wrong to let Summerfield, Jack Smith and the other boys run alone." So he said, "all lite I stay." Watch for the Squeedunk posters today and watch the leaps and bounds in the queen voting contest. When the votes were counted last night it was found that Quong Sing is slowly gaining on Dr. Summerfield and Dr. Miller, although a "black horse" in the race is forging ahead. It was reported last night that a bunch of votes had been handed to Nathan Rosenbaum, but up to the time of going to press the report has not been fully verified. "I'm in the hands of friends," said Frank Dowd last night when told of the day's gain for him in the voting contest. "So am I," echoed Jack Smith, who was in hearing distance, and who had made a substantial gain. Jake Luppold, "the mayor of Main Street," threatens to put a candidate in the race with Summerfield and Aubrey Barham, and if he does his friends, "the nickle splitters," will have to look out. Meanwhile "Jim" Johnston and the other ones anxious to be "maids of honor" to the queen, are waking in breathless expectancy to know if [the] position is to be thrust upon them. Vote for your choice at a nickel a vote. Charles Holmes says, "vote early and often." It was discovered by the committee in charge of the queen contest for Chris Stengel was the dark horse, and a large vote had cashed for him yesterday by the never treat club. Caterers Lewis O'Brien and Walter Farley have promised a cow had breakfast to the new queen and her maids of honor. They will also serve a sore head and breakfast to the defeated candidates. The "Ancient and Disreputable Order of Squeedunks" fairly bubbled over with enthusiasm at the meeting held last night when final plans for made for the great feature parade and exercises that are to furnish the best sidesplitting remedy for the blues in the big pageant her on the Fourth. Right now, a word of advice. If you're at all susceptible to fun, don't miss the Squeedunks. At last night's meeting Charlie Holmes showed up fresh from a week's outing at a nearby village, bringing with him all the latest ideas that had flooded his brain while enjoying the exhilarating ozone of the country. He is to be the orator for the Squeedunks and when it comes to that he is hard to beat. Here are some announcements: All those who intend entering features in the Squeedunk parade must report to C. C. Donovan. All those who are willing to donate horses and wagons for the parade are requested to notify Virgil Butts at the office of County Tax Collector Collins on Third Street, and Lester Brittain at the office of county assessor Frank Dowd. All those who want horses and wagons for their displays are instructed to notify these gentlemen as soon as possible. Just a word about the horses and wagons. It makes no difference how ancient or disreputable the horse or wagon may be, if both can go, loan them to the committee. If a few oats or some bale rope are needed to make them go, apply them. There need not be any putting on of frills. The Squeedunks will see to that. It was reported at the meeting that two enthusiastic citizens, supporters of rival candidates, so far forgot themselves as to pummel each other's anatomy. This is hardly right in the opinion of the committee, as some one may get hurt and be unable to come in at the finish with the requisite votes. The committee wishes to register a kick. It has offered no objection to beer checks or slot machine slugs being voted for nickels because they are some element of value. But when it comes to voting bread tickets the committee considers it is time to call a halt. It is too hot to eat bread at meetings of the committee. Last evening there was a parade of the newly organized Native Sons' Drum Corps, and it was a call to arms of the Squedunks for their meeting at the Bacon garage. The boys drum well and attracted considerable attention on the streets. Captain Sanborn stated last night that the corps will be out tonight in parade to attract the crowds out to the baseball benefit ball and fete at Grace Brothers Park. Like a bolt of lightning out of a clear sky, like a stroke near unto death, came the announcement to the Squeedunk queen candidates that whoever was the elected lady, she or he would have to wear a peek-a-boo waist. This decision came after a secret meeting of the Committee on Robes and Coronation. Both the peek-a-boo and the directoire or [sic] split up the side skirt were suggested for the queenly outfit. Some of the committee had never heard of the garment, consequently were at first disposed to look with favor on the skirt until Will Rohrer, who introduced the matter, exhibited a picture of a lady clothed or rather unclothed in the Frenchified dress. After Mr. Rohrer had tranquilized the indignant committeemen he in language drawn quite mild explained that it was really a classic skirt and considered exceedingly proper. But the display was too much. W. W. Skaggs, the chairman of the committee looked the other way while they blushingly turned the directoire down. The committee, however, compromised by accepting the peek-a-boo and Mr. Billy Rohrer was notified that bids would be received from Santa Rosa and Healdsburg clothing houses for the supply of an elaborate royal peek-a-boo for the Squeedunk clean. But trouble is on. The candidates all say if elected they will not wear the waist and every blessed one of them, including Quong Sing, threatens to withdraw from the contest. John Walker says he has worn clothes pretty near all his life and he is not going to leave them off now. Aubrey Barham says he sunburns easily and he would be a blister before he rode three blocks unless it happens to be a cloudy day, and he can't afford to take that chance. Doc Summerfield says he has an English strawberry mark on his right shoulder that can be seen a mile and blast him if he is going to make a spectacle of himself exhibiting his body in that matter. Quong Sing says in China ladies were plenty of clothes and it really would not be honorable for him to dress less than his countrywomen. Colonel C. C. Donovan says the wihinas of Honolulu, the meztizo of Manila and the geishas of Yokohama and the barmaids of London haven't got to the peek-a-boo yet. As the "uncrowned" he cannot sacrifice propriety for a queen's crown. Jack Smith modestly thinks that kind of garment not becoming for fleshy people, as the transparency of the fabric accentuates the wearer's attractiveness and the masculine does not desire that attention--to himself. The other candidates have filed their objection to the waist and it is believed that the committee will substitute for her majesty's robes. The loving cup of handsome finish and artistic design has been changed to a loving bucket. This will be more approaching this taste and capacity of competitors. All those who have features, vehicles and horses for the Squeedunk parade will see Colonel C. C. Donovan, Captain Virgil Butts or Corporal Lester Brittain. These gentlemen compose the committee on freaks and skates and with them everything goes. Louie O'Brien is fixing up a rare "hand out" for the queen and the maids as they ride through the parade. As the result of the never-to-be-forgotten election in Geyserville Friday Cook was declared the popular choice for queen. Queen Friday is the right one in the right place. This is what his can campaign slogan declared. He will select his maids of honor within the next few days and they will be taken from among the leading citizens of the Geyserville community. The controversy over the wearing of Peekaboo waists that arose and for a time seemed likely to disrupt the galaxy of aspirants for queenship honors in the Squeedunk realm, has been satisfactorily adjusted. Articles of agreement have been drawn up whereby the queen and the maids of honor may fortify themselves by wearing chest protectors beneath their peekaboos. This provision has wiped away all obstacles as regards details of the royal costumes. A monetary surprise was given the committee last night when the Chinese Squeedunk Tong Cantonese No. 1 presented the Tong Santa Rosa Squeedunks with a donation of $15.50 towards the celebration. Charley Quong Sing, not with any selfish motive of making votes thereby, collected from the Chinese residents the sum named. Quong is still in the race for queen and said last night if he wins he will ride in the parade, "dressed alle same 'Melican queen." Last night there was a large gathering of candidates at Chief Frank Muther's place. Upon investigation it was discovered that the Dr Miller, Dr. Summerfield, Jim Johnston, Willis Gauldin, Jack Smith and John Walker had combined to beat Quong Sing. Quong has fireworks for sale and the plan was to get Quong to withdraw under threat of prohibiting the use of fireworks on the Fourth, which matter chief Muther was to bring before the council. It was stated that he had already promised to appoint Councilman Fred Forgett one of the maids of honor. Forgett, when seen, refused to commit himself, but the committee are hopeful of getting "Billy" Nichols to turn state's evidence. It was also announced at the Dunk McKinlay had offered his services to the committee. A show at the Richter on Thursday night for a benefit for the Squeedunks is one of the possibilities. The great Squeedunk parade "broke loose" about 3 o'clock as agreed, and attracted an immense crowd. There were more people on the streets than during the hour set for the morning procession. The bits were all clever, and the various ideas splendidly worked out. In fact, the general opinion seems to be that it was one of the very best Squeedunk parades ever seen here. The Woman's Improvement Club woman out riding a bicycle, while the joshes [sic]. One float dedicated to this organization was labeled "Horse Prohibition," and showed a watering trough some twelve feet high to which it was necessary to elevate the horses by means of a derrick. Imitation hobbyhorses were used, of course, and as they were raised one by one into the air much amusement was caused. Another good one was supposed to show Burbank's "latest creations." There were all kinds of rare and unknown plants, eggs were growing on bushes, an umbrella or two had sprouted, numerous successful "grafts" were exhibited--and all the time the typewriter was working overtime. The new federal postoffice building "built two years ago," was represented by a vacant, hay-grown lot, surrounded by an old-fashioned wormwood fence. The "Latest Improvement of the Woman's Improvement Club" showed a woman out riding a bicycle, while the men-folks were at home running the sewing machine, washing the dishes, getting dinner, taking care of children, etc. "Gray Jim's New City Park" was a scrap pile. An immense sea-serpent was labeled "What They Found in the City Water." The "New National Bank Building" was portrayed by a rusty coal-oil can with a smaller coal-oil can for an annex. Some of the others were "The Municipal League Accuses Frank Muther of Stripping Tobacco." "What Santa Rosa Got for Her $200,000 Bond Issue," Fred Rushless (Rushmore) on a Fishing Trip." "Chris Donovan in Japan." "Mayor Gray and His Carnival Attendants," etc. etc. "I'm not a dead one just yet," remarked Captain Hamilton, the noted aeronaut, when he struck the skylight over Moke's undertaking parlors Saturday night in his descent from the clouds in his parachute. If the framework had not saved him he would have come through the skylight and dropped to the floor in the chapel connected with Moke's establishment. When his parachute struck the glass there was a lively smashing and it startled Mr. and Mrs. Moke and others. Hamilton was not cut by the glass. Thousands of people witnessed Hamilton's ascent and descent both of which were very successful. It took the big balloon some time to fill up with gas, and consequently the ascent was made a little later than scheduled. But everybody was pleased and Captain Hamilton was a much complemented man. The balloon fell some distance from where Hamilton alighted. Will Rohrer rode In the Squeedunk parade on Saturday, an Ideal queen of the Squeedunks. He looked royalty itself. His maids of honor were Frank McNamara, Charles Smith, Roney Noonan and Ed McNamara and they all looked very fetching. Calvin Rohrer and Carl Patterson were the maids. C. C. Donovan was the grand marshal and he rode a cow at the head of the parade. Virgil Butts was the president of the day, Chas. H. Holmes, who cut off his mustache for the occasion, was the orator. Clarence F. Lea read the "Declaration of Indifference," and President Butts read the poem. The Squeedunk paper, "The Truthful Lyre," sold like hotcakes, and there are still a number of copies left for those who want them. It is a very neat souvenir of the day. Thursday night the Squeedunk committee of the Fourth of July celebration held its final meeting, paid all bills and generally wound up the business. After the payment of all bills there will be there will be a small surplus in the treasury which will be deposited in a local bank to the credit of the "Squeedunk fund," which will be a neucleus [sp] for future celebrations. Bacon Brothers, Main street garage, first prize; Charles Body and Albert Bacigalupi, second prize. August Kopf and Ed Rohrer, best sustained "take off." Roy Enders, consolation prize. Of course the prizes will be something of great value. When they are secured they will be placed on exhibition in the show window of the McConnell-Prentiss Company on Fourth street, and they are sure to be greatly admired. Due announcement will be made of the time of the display so that there will be no danger of overcrowding in front of the store.